Who wants to spend a relaxing holiday for two or an unforgettable vacation with children or friends who is in 'El Gallo' is the right address. 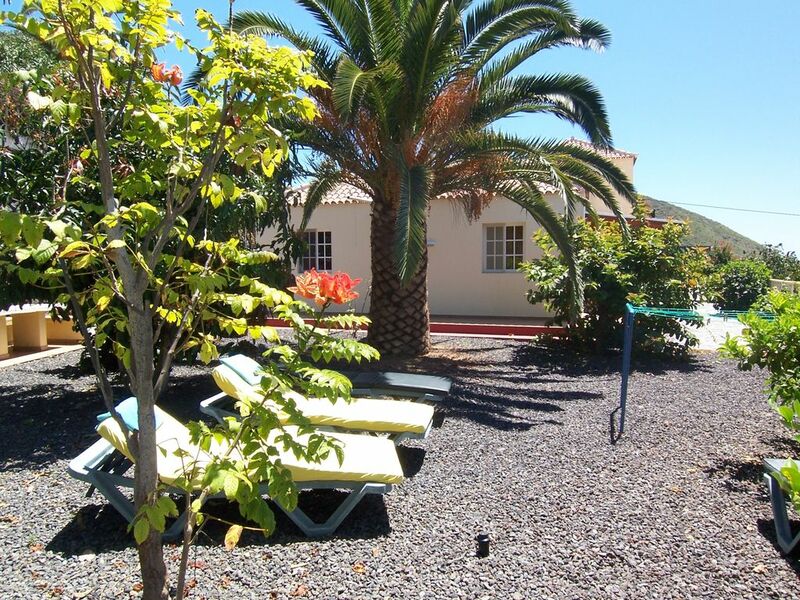 The holiday on the sunny west side of La Palma stands out with her grown through the years of charm: The German owners have equipped accommodation unit with great attention to detail and all the necessary comforts to the internet connection. In the garden trees, palm trees and colorful flowering shrubs convey a homely atmosphere, and around the pool in the heart of the accommodation to meet for swimming, sunbathing or sometimes in the pavilion area to the common barbecue grill. The Garden Bungalow for up to 6 people: Plenty of space for families with children or groups, the garden bungalow. In addition to a terrace guests can use a large garden with palm trees, citrus trees and a barbecue area with seating for disposal, which is only used by them alone. Previously undeveloped land stretches - ie class ocean views and great sunsets. Inside, we gather in the spacious living-cooking area under the cozy Canarian wooden roof. Here can be cooked to your heart's content, a 4-burner gas stove and an electric oven make this possible, a dishwasher facilitates the washing up. How can home be watched German on a comfortable sofa, a music system, CDs and books also provide entertainment. In two of the 3 bedrooms are double beds, the third has 2 single beds - the mattresses are good and 2x1,80 meters, guests resting under German ceiling. The two bright bathrooms are equipped with shower and toilet. Language and service: Language problems there's the 'El Gallo' is not. The owners speak German, English and Spanish, live nearby and are available to guests eager to offer advice and practical help. The team from 'El Gallo' is looking forward to your visit! Extras in 'El Gallo': If you have always wanted to work with glass, may stop by Gudrun. She has in the entrance area of ​​the plant a small workshop where they produced 'tiff Funny'-unique - that's the fun of the classic Tiffany-technology development. Anyone fancy a course has - no problem. In 3 to 4 hours can be learned to work with glass, where guests tinker their own individual La-Palma-souvenir. Change of towels twice a week. De woning ligt op een rustige plek, tussen bananenplantages. Centraal, tussen Tazacorte, Los Llanos en Puerto Naos. De inrichting is eenvoudig. Er is geen verwarming aanwezig. Grote tuin en een onverwarmd zwembad. Wifi was goed, nadat we een modem in de woning geplaatst kregen. Kijk uit met douchegordijnen, want de badkamers staan al snel blank. Douches zijn wel heerlijk. Wir haben uns sehr wohl gefühlt in dem weitläufigen Apartment mit 3 Schlafzimmern, Wohnküche, 2 Bädern und einem tollen Garten mit Obstbäumen, Grillplatz, Liegen und einem traumhaften Blick aufs Meer. Das Haus war gemütlich und sauber, die Vermieter und das Personal sehr freundlich. Es hat nichts gefehlt für ein entspanntes Weihnachten unter der Sonne. Grosses Plus waren Spülmaschine und Waschmaschine, die wir gern genutzt haben. Unsere Kinder hatten grossen Spaß in dem sehr gepflegten Pool und der Anlage mit toller Bepflanzung! Wir kommen gern wieder. Perfect location, but the house needs an update. Especially the furniture (inside and outside) is outdated. Sehr schöne Unterkunft mit traumhaften Blick aufs Meer! Sehr schöne Unterkunft mit traumhaften Blick aufs Meer ! Gute Lage kurze Anfahrt nach Tazacorte und Los Llanos ! Einkaufsmöglichkeit in der Nähe. Logement classique et piscine partagée extra. Piscine partagée extra. Superbe vue, mais beaucoup trop de Champ de Bananier autour du logement. Pas de micro-ondes. With the fairest of 'El Gallo' is the view: From the terraces, guests look out over banana plantations across down at the 200 meters deeper sea. Because the property was built in the best climate zone of La Palma. It lies on a little-traveled roads between La Laguna and Tazacorte where palmerian weathermen are the most sunshine hours per year. Accordingly, you drive to the beach, boat trips or even for shopping in the large supermarket just down nearly 5 minutes after Tazacorte. The essentials can be seen in small mom and pop shops buy Todoque or La Laguna in just 3 minutes away places. Who wants to extensive shopping, all within a 10 minute drive, the city of Los Llanos. In just 10 minutes by car, the 'El-Gallo' guests reach the seaside resort of Puerto Naos with its 500-meter long, palm-shaded sandy beach, numerous bars and restaurants, a mountain bike rental and a paraglider-Treff.